These antennas can be made from just about anything and perform well. With a little fine tuning and trimming they can easily be used for GMRS, MURS and other VHF and UHF radio needs. A recent post comment got me to thinking about how so many people today are truly “owned and consumed by their possessions”, as recently stated by an observant M.S.B. Reader. This ‘condition’ is arguably one of the core root causes attributing to the high stress of modern day life. Don’t get me wrong. Who wouldn’t like to have more than just the necessities of life, or bigger and better versions of those same necessities. Who wouldn’t enjoy having nicer ‘toys’ to play with. In fact, there is absolutely nothing wrong with the possession of such things in my opinion, provided that you are not owned or consumed by them! A possession that owns you may mean that you owe someone or some institution to have possession of that possession. You have it, but don’t own it, and are under contract to pay for it under the agreed terms. Therefore, the possession really owns you. You are consumed by a possession or possessions when it or they expends you, or uses you up. How? 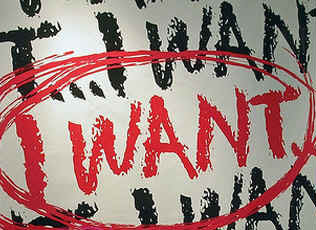 By either the debt that you owe for it or them, or by the emotion, ‘greed’, – the ‘keep up with the Joneses’ syndrome. For whatever reason, probably my upbringing, I have never been overcome with the emotion of ‘keeping up with the Joneses’, or the mentality of leveraging nearly everything I earn so that I can ‘appear’ to own possessions that are beyond my means. As I have lived life, I have been astounded at the acceptable notion of many that are younger than me, that it is OK and normal to leverage what they earn to purchase possessions that are way beyond their means. Some may argue with me that this is a ‘bad thing’, since they are perfectly capable of paying their debt each month when the bills come… however they are missing a few extremely logical and important points. What are they sacrificing for having these possessions now (rather than later – or at all), and what if their ability to earn the required sum to pay the bills is taken away from them. The point is, when you owe, you are a slave, even though you may not feel like it right now. I just heard a news report today that many Americans will now have to ‘work’ into their 80′s before they can retire! Are you kidding me?? What kind of retirement is that??? It used to be that people would live within their means, meaning they would not borrow more than what they knew they could pay off in a reasonable time. Better yet, save the money, forgo the instant gratification of having it now, and pay cash for it later. No debt, and therefore not a slave to the system. When borrowing money, the interest you pay on that money, over time, will amount to an extraordinary sum… a sum which could have been in your pocket instead. Don’t fall victim to feeling like you have to keep up with your friends or neighbors who have nice things in their possession. Just know that most of them really don’t own them, and are sealing their fate by burdening themselves with excessive debt and a long life of slavery. Instead, just smile, and know inside yourself that you will likely build real net worth by simply remaining frugal and happy with the things that you can afford. Your life free of debt will be truly rewarding, and you will have a reasonable chance of retiring at a reasonable age. Debt, Government, and Change, is it Too Late? While many survival sayings refer to attitudes and mindset, some sayings have a very direct relation to our survival. Anyone can cross certain boundaries when faced with the critical decisions in a survival situation. It is important to remember that some boundaries serve a definitive purpose for our survival and violating these boundaries can have deadly consequences. Hunger can be a simple but very real threat to your survival. It is an almost automatic response of our bodies. When we feel hungry, we eat. We do this without giving much thought to our food or how we would satisfy this need if situations were to change. We sometimes eat to excess without any real need but merely because it is there. The problem arises when it is not there. We will still get hungry and we will still need to eat but it may have to be at a vastly different level than that which we are accustomed to doing. Having a long term food storage program is one of the best solutions to this problem. A long term food storage program can also create problems of its own. This is the problem of food that has gone bad and is no longer useful or safe to consume. In a survival situation where resources may be limited, this can be a dangerous problem for survival. We have a tendency not to waste our resources and often take chances by doing things we shouldn’t. Whether you are facing a real survival situation or just struggling with surviving on a day to day basis, there is a simple saying that relates to the safe use of food to prevent it from becoming what may be a serious threat to your survival. Instead, there has been a noticeable movement of ordinary folks whose eyes have opened and are seeing for the first time the bigger picture of ‘the system’ which is designed to keep them slaves to the masters who control the money and the world itself. To become a modern survivalist, it’s really pretty darn easy, and sensible. By my own definition, I would dare say that the majority of people just a handful of decades ago would be considered modern-day survivalists by today’s standards. Does this mean that to be a survivalist or prepper, or preparedness minded, that we have to live like they did – way back when? No, of course not. Being a modern day survivalist, we can continue to work within the same system that is trying to make us slaves, but instead we simply outsmart it. It’s really quite easy to do actually. Want to know how? All you have to do is rid yourself of all debt. Period. End of story. I’m sure that most of you reading this have debt in one form or another. That’s not meant to be a dig on you, it’s just a reality that has been subconsciously forced upon most people by various calculated means. Debt is the life blood of the system. It needs debt to even exist. If you can find a way to rid your debt, you will be stunned by the liberation that you will feel in your gut. Without debt, you are entirely in control of your destiny. Although these things are insurance towards survival under certain conditions, the primary path to survivalism is not to be beholden to anyone else (no debt), and, you need the ability to adapt. The way to get out of debt is pretty straight forward. It involves will power, and cannot be done unless you really want it. It will require sacrifice, time, and lifestyle change, but the end result will be orders of magnitude better than the sacrifice you will suffer. The ability to adapt however, is a different story. This is more of an ability to execute actions based around common sensibility, open mindedness, and strategic planning. To survive, you need the ability to adapt. It’s that simple. Most people are programmed to think a certain way. People are taught to accept a particular way of doing things and to not question the rationale. Those who question are often chastised. This becomes so ingrained in your psyche that you fail to realize that there is more than one way to get from point A to point B, so-to-speak. Keeping a ‘healthy skepticism’ is a very good thing. Don’t automatically believe or trust what you are told. Use your own sense! The rule-of-thumb is, if something is true or right, it ‘usually’ will ring true. In other words, trust your gut – it’s usually right. The older you get and the more life experience you have, the more often your gut is absolutely ‘right’. Well, you get the idea. It’s food for thought. Open your eyes, and look around you. Dig a little deeper into the ‘why’ things are happening. ‘Follow the money’. Don’t automatically believe that the main-stream is giving you the story in context. Think. Know what it is that is important to you. Consider what it is that really makes you happy. Motivate yourself. Imagine what it will be like when you’re out of debt. Picture yourself in control of your own life with those that you love, doing what is important. It’s about life. Not things. It is the exact opposite of what ‘the system’ is trying to convince you. You may not know it or believe it now, but one day, you certainly will. Let’s hope that it’s not too late. The gentleman decided to come over to my house to show me how to make his very delicious pickled okra, instead of me hauling everything over to his house. There's only a few ingredients, and the recipe can be adjusted from one jar to a hundred easily. Here's what we did. Wash okra well and dry it. 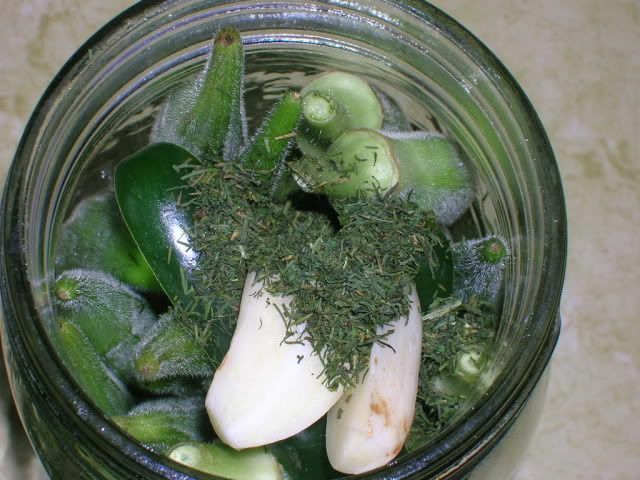 Stuff as many in one of your sterilized jars as possible, leaving enough room to add a few slices of peppers, a teaspoon of dill, and a peeled clove of garlic. 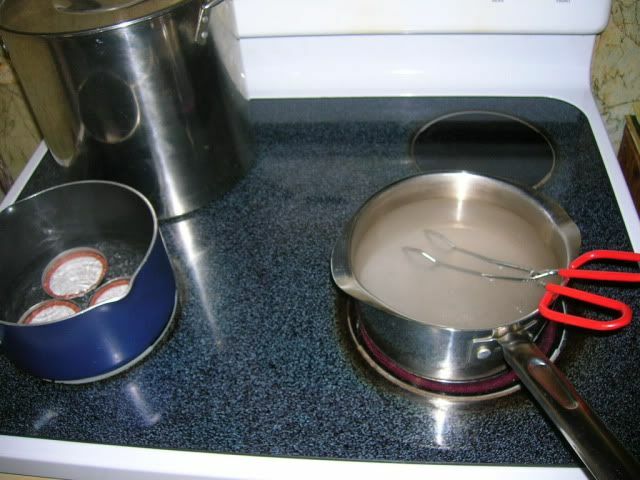 put 1 cup of vinegar to one cup of water PER JAR into a saucepan and add about 1/8 cup of canning salt per jar. Bring to a boil. At this point it's a good idea to put your jars into a pan of hot (not boiling) water to help adjust for the shock of pouring boiling liquid into it. Pour your vinegar concoction straight into the jar leaving as little headroom as possible and while it's still good and hot, use a towel to tighten the lids and rings on, then turn upside down and allow to cool. Don't open or eat for 21 days. In my case, I'm using pint jars and had enough pickle to make one more jar, but this is as much okra as I've picked yet. 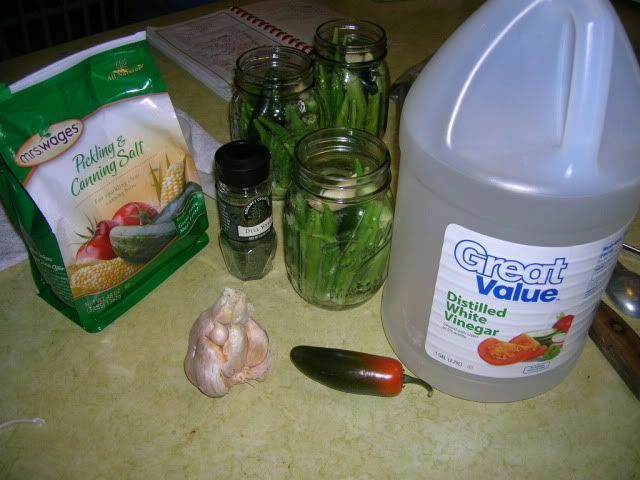 This recipe makes very crisp and delicious okra pickles. The flash boil is supposed to stop the enzyme action while not making the okra soggy. 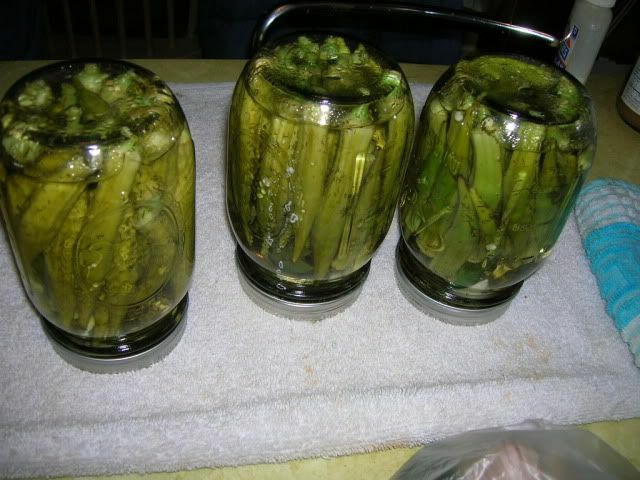 The Ball canning guide I mentioned in another thread says that some of these practices are "inferior or obsolete" but this man has been making pickled okra this way for 50 years, and since I already ate two jars he gave me, I'm certain that this method works just fine. I've been working 14-16 hour shifts out of town. I'll try to get something up ASAP. There’s something we don’t like to think about in the midst of our prepping for survival. But it’s the undercurrent that flows with all we do to be prepared. We’re trying to beat the Grim Reaper. In other words, we don’t want to die. We want to prolong life as long as possible. After all, that’s what survival is about, isn’t it? Aren’t we aiming to outlive others around us when we’re in the midst of adv ersity? But the fact is, you and I are going to die someday. And before that happens, we may see many others die around us. And it will be painful. Perhaps those who die will be friends or beloved family members. Perhaps cherished pets. Perhaps neighbors will die in a tornado, flood or fire. Many deaths will result from a societal and economic collapse the likes of which we’ve never seen before. It could be a One Second After scenario. I’m not predicting anything. I can’t know the future, and neither can you. I believe the prophecies found in Scripture give us the big picture, but the exact details are yet to unfold. Obviously, Harold Camping and others of his ilk who went before him got it wrong. 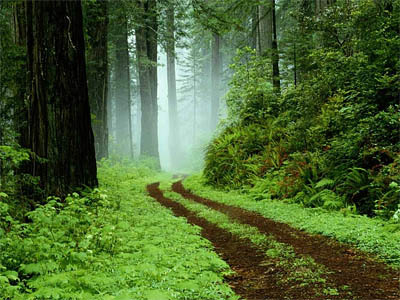 Moving through the mists of tomorrow is one of the most difficult challenges of prepping. We’re preparing for the unknown. But to ignore it is folly. Once it was human nature to practice self preservation. To do anything other than what we think of as prepping would have been laughed at as foolishness. Has self preservation been conditioned or bred out of us? Ignoring death is to be in denial. It simply postpones the inevitable. Our ancestors acknowledge death as an ordinary, inescapable part of life. It’s time we do the same. Yet, we prepare. It’s one of those nagging dichotomies we face as long as we draw breath. Prepping should be an acknowledgement that death is real, but we’re making the choice to face it with wisdom and courage. Someone who calls herself the Patriot Nurse shares thoughts on the deaths that will happen if or when we face major calamity throughout the country. It’s sobering to say the least. Are you ready to think the unthinkable? Watch these videos. Then why not share your thoughts with a comment below? Who will die in the next wave? 3 gallons of water per person, minimum, in a food-grade, plastic container. Minimum 5-day supply of non-perishable food that requires no refrigeration or preparation and little or no water. Here are blog posts and videos on constructing and using wilderness survival shelters. Survival Shelter | Flickr – Photo Sharing! Use a military poncho as a survival shelter! Here are 9 Different ways to do it! 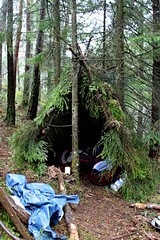 An survival shelter is an important component of an wilderness emergency kit. Here’s a list of several light-weight tarps that can be packed away and easily carried. We show you how to build a Wilderness Shelter should you ever be caught out in the wilds. The quality has been significantly reduced from the original footage. primitiveskills.com At the Scout Basic course build a survival shelter emphasizing low profile. Building shelter with a basic plastic tarp and para cord in winter. www.destinysurvival.com presents this short feature on a couple of inexpensive, easy to build geodesic domes for use as shelters for survival, storing belongings, or mini-greenhouses..
Ray Mears shows us how to make a strong shelter in wet forest, and the right and wrong ways to strike a match.